Whatever happened to the ’90s? One of the biggest gripes I have against mass media and pop culture is that they always seem to overlook my generation. Oftentimes you see tv shows and movies set in previous decades like That 70s Show or Stranger Things which is heavily influenced by the classic Steven Spielberg movies from the 1980s. Even TV shows like Downton Abbey taking place during the early 1900s are more commonplace than media encompassing the period between George H.W. Bush and Bill Clinton’s Presidency, and I find it irksome to the nth degree. First off, YIIK: A Postmodern RPG is not a perfect game, far from it. I encountered issues throughout my playthrough, including a game-breaking bug during a balloon-kissing segment which forced me to restart the game, but even that wasn’t enough to pull me out of the experience. At first, my plan was to play an hour or two while recording the gameplay, then take a step back and detach myself from the experience, go back in and continue with the same back-and-forth until I finished the journey, but at one point I could not disconnect my hands from the controller and my body forced itself to continue to play even when I was at the edge of exhaustion from a gaming marathon. Needless to say, YIIK: A Postmodern RPG captured my attention and it never let go. 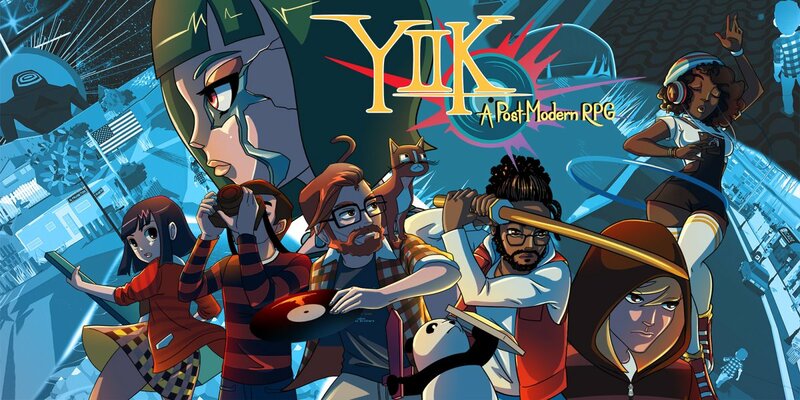 YIIK: A Postmodern RPG shows you the world through the eyes of Alex, a college grad who returns home only to have his world turned upside-down when he sees a woman vanish from an elevator. Although their time together was brief, it is that sense of loss that drives him to try to find and rescue her from supernatural entities. It is also that same sense of loss that unites the characters that will soon be aiding Alex on his journey. At face value, it would be easy to characterize the game as a humorous take on 90’s pop culture, full of references that more often than not had me recite Captain America’s famous quote from the Avengers movie, “I understood that reference”, but once you dig deep into the narrative, it is just as much a “growing-up” story for the main character as it is about overcoming pain and personal loss. Depression is a lingering theme amongst all of the characters you come to meet, something that becomes even more exasperated as the stakes of their journey become higher and the ticking clock towards a new millennium is about to expire. YIIK: A Postmodern RPG is described as a “surreal, Japanese-style RPG”, and for the most part it is an apt comparison. The turn-based combat is a collection of mini-games specific to each character which relies on precision and timing so that you can properly hit the targets and increase the damage output. Alex, for example, has a portable record player that he needs to hit the sections to either amass combos or allow him the opportunity to continue to stack hits on top of one another. Claudio has a katana which if timed just correctly can activate a combo that allows him to hit multiple enemies at the same time. These mini-games remind me a lot of the ones found on Undertale whenever you are doing your pacifist or attack commands and work to always keep you on your toes. If you were used to JRPGs being a laid back experience, YIIK: A Postmodern RPG forces you to be focused on the screen at all times. This works for the most part, although people will complain that the battles are too slow or that the characters don’t hit hard enough, but it is very important that you utilize all of the different options at your disposal. Ackk Studios can’t really be blamed for not being more “in your face” when it comes to listing things that can help you maximize your experience with the game, but they have been kind enough to provide an FAQ/WIP Walkthrough that highlights some of the options at your disposal. Among those is the use of “Time Energy” by pressing on ZL. Normally you would press it to slow down your actions so that you can more precisely hit on the proper areas to extend your combos (or be able to defend yourself or even dodge enemy attacks), although the downside to this is that it can run out pretty quick and takes some time to build it up again. Instead, you can go to the game’s menu and turn on Assist Mode so that “Time Energy” can have unlimited use. It is recommended that you head over to their FAQ page if you are having issues with different aspects of the game. It is at times like these that I wish games were released in physical format at all times and featured a booklet that would display the awesome artwork of the game. The game’s visuals are stunning in a 1990’s Super NES kind of way which will be an initial draw to everyone looking for the next-great JRPG to play, but the humor and pace does take some getting used to, to the point that a good amount of people will walk away from it. I’ve heard some people refer to the writing as pretentious, but this is in part due to us viewing the game unfold through Alex, who certainly still has some growing up to do. Regardless of your personal take on some of the characters and interactions, the game has many redeeming factors. I could specifically point out the game’s stellar soundtrack which should make plenty of “Top 10” lists for 2019, or that the voice acting not only brings life to the characters but gives them authenticity and sincerity, or even that the game’s quirky designs which are one part South Park, one part grown-up Earthbound feel right at home within all of the madness. When judged by the sum of its parts, YIIK: A Postmodern RPG is truly a very unique and worthwhile experience and a $19.99 price tag is a very reasonable asking price for admission. YIIK: A Postmodern RPG has been a long time coming. Originally announced as a Wii U entry back in 2015 with a 2016 release date, the game suffered from a long delay that pushed its release three years later, but that ultimately paid off in the quality of the finished product. The Allanson brothers have crafted a coming-of-age story that not only will entertain whoever plays it but at its core can even help out those who are suffering from depression and are in desperate need of someone to sit down with them and hear their story.